Dental implants are used to replace and fill a gap left by a missing or extracted tooth. Dental implants can be used to help restore a single tooth or can be used to replace an entire arch of teeth. Implants are often used over the more traditional, removable and often inconvenient dentures. An implant is as close as possible to having a real tooth again. Attaching a dental implant involves two stages. The first stage involves the implant itself, which generally takes the form of a small titanium fixture, to be inserted into your jaw. Once your dentist has ensured the implant has assimilated into your jaw bone properly, to guarantee it can provide stable support, your dental crown will be attached. The crown will help restore the appearance of your smile as it will fill the gap, and will go undetected as it will look like one of your natural teeth. In various cases where patients have lost a majority of their adult teeth, multiple dental implants can be used either separately, or as a part of a bridge, or as means of retaining an overdenture. Of course, the natural teeth that exist in the mouth (if any), will be evaluated to ensure they can support such oral devices. If existing teeth are not strong enough, it may be recommended that they are extracted which will be replaced with multiple implants that will be strong enough to support a full arch of ‘teeth’. Before undergoing any sort of dental implant procedure, your mouth and jawbone must be examined. Your oral hygiene and mouth must be in a healthy and stable condition. Any sign of disease or dental issues must be addressed before going ahead with permanent oral implants. There also must be enough bone in the jaw to hold and support the implant as it is possible that your body may reject the implant due to a lack of bone. If there is a lack of bone, your dentist may carry out bone augmentation or bone grafting. As your dental implant will mimic the look and functioning of your natural teeth, it is important you take the same care and maintain the same habits you do with your natural teeth. This means you must brush twice daily, floss once a day or use an interproximal brush and maintain frequent dental check-ups. 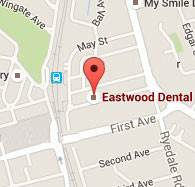 Eastwood Dental encourages twice yearly oral hygiene appointments. You will also have follow-up appointments after your implant is attached to ensure your body and mouth are accepting and working with the implant. Call to make and appointment today.